Have a new tool for catching the male dog that likes to sneak away and urinate in the house because he isn’t fully housebroken. Protect your home and furniture from the male dog that likes to mark his territory. Play down submissive wetting in mature male dogs which is an important key to resolving this problem. Stop urine spotting from excited male puppies when guests arrive. 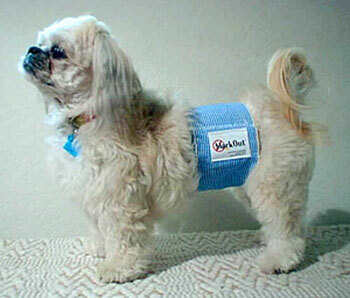 Spare yourself and your senior male dog from the emotional upsets that his incontinence presents. The MarkOut® Marking Training Kit will save your carpet and your sanity! The MarkOut® Manual and the MarkOut® wraps are designed to be used together as a training system to eliminate your male dog’s problem behavior. The wraps ensure that the only thing your dog marks is himself! The manual is a virtual private lesson with Karyn Garvin, a dog behaviorist who specializes in marking problems.